Neue Farben auf diversen Items, ein paar sind halt mit neuem Design. ungefähre schätzung wann es auf isro kommen wird? Weis man schon wie die Waffen und das equib aussehen werden? Der Staff sieht echt geil aus. Mir gefallen auch diese kleinen Lichtanimationen in den Waffen. We the GM team would like to introduce the new 12 Degree Item upgrade system. This system will allow you to upgrade your 11 Degree weapons and equipments directly to 12 Degree. If 11 Degree items are currently the best, Then you should upgrade them to 12 Degree because it is more powerful. How to upgrade to 12 Degree? Let's check it out. 1.Let’s prepare the items needed for the 12 Degree upgrade. Key point 1! We need 11D equipments. Key point 2! The Minimum requirement to upgrade to 12D is an 11D equipment with +7 or higher reinforcement. Key Point 3! Upgrading will not work if you used an “enhanced level option scroll” on the equipment you are trying to upgrade. 2.Let's take a look on how to upgrade to 12D. Key Point 4! 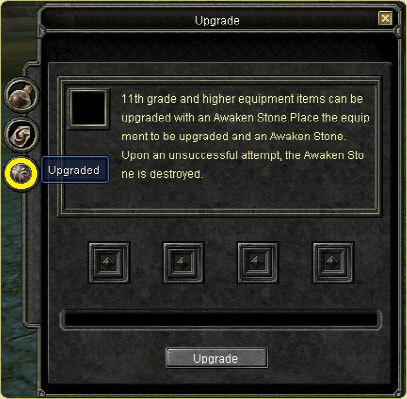 The Awaken Stone is the item that upgrades 11D equipments to 12D equipments. 2-1) Click Y to Open the Alchemy Window. 2-3) Place your +7 11D equipment and the Awaken Stone in the spaces provided in the Alchemy window. Then click upgrade. Now what remains for you to do is wait whether the Upgrade will succeed or fail. Key Point 5! If it succeeds then your Item will be upgraded and transformed to 12D. Key Point 6! If it fails, then the 11D equipment will remain but the Special Awaken stone will disappear. Key Point 7! Equipment attributes and magic options on the 11D equipment will not be transferred to the upgraded 12D equipment. Only sockets are transferred. Key Point 8! It is possible to retain some of the 11D equipment's reinforcement to the newly upgraded 12D equipment. However this is random and it is not ensured to happen all the time. * “Awaken stones” can be obtained from monster drops. * There is a “Special Awaken Stone” available in the Item mall that has a higher rate of success when upgrading 11D equipments to 12D. If you succeeded in upgrading to 12D, congratulations to you! However we believe that you would want to make it more stronger by reinforcing your new Upgraded 12D equipment. 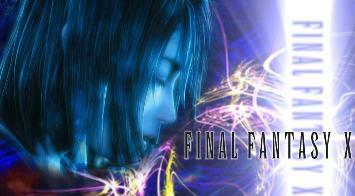 We the GM Team will teach you how to reinforce your 12D equipments. To strengthen 12D equipments is different from strengthening lower Degree equipments. so, Please check the details below before trying to reinforce your 12D equipments. - Can only be reinforced by using Enhancer, and not the normal elixir. - When destroying 11D, Advanced elixir will no longer be obtainable. - Maximum reinforcement grade of 11D item will be changed to +15. We highly recommend that you use your advanced elixirs on your 11D equipments. 1. Click Y to Open Alchemy Window. 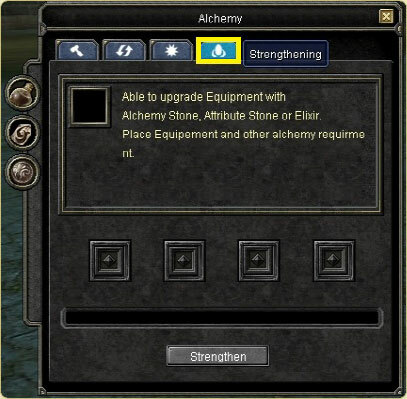 3.Put your 12D equipment and enhancer on the Alchemy window and start reinforcing. Key Point 9! When the reinforcement is successful, the equipment will get a +1 reinforcement. Key Point 10! When the reinforcement fails, the equipment and the enhancer will disappear. But if you used a magic proof stone on your equipment then it will not be destroyed and the current reinforcement grade will only get a minus 1 reinforcement. Key Point 11! item Enhancer can be obtained from monster drops. Key Point 12! Magic proof stones which are used to protect your 12D equipments from being destroyed due to reinforcement can be obtained from the item mall. This update may change as details are currently being developed. When updated, we'll guide you through announcements.